Is there a calf in there? A few weeks ago, we had a crew of people out in our pastures. Although the set up and take down took a little time, the reason behind all the work was definitely important. 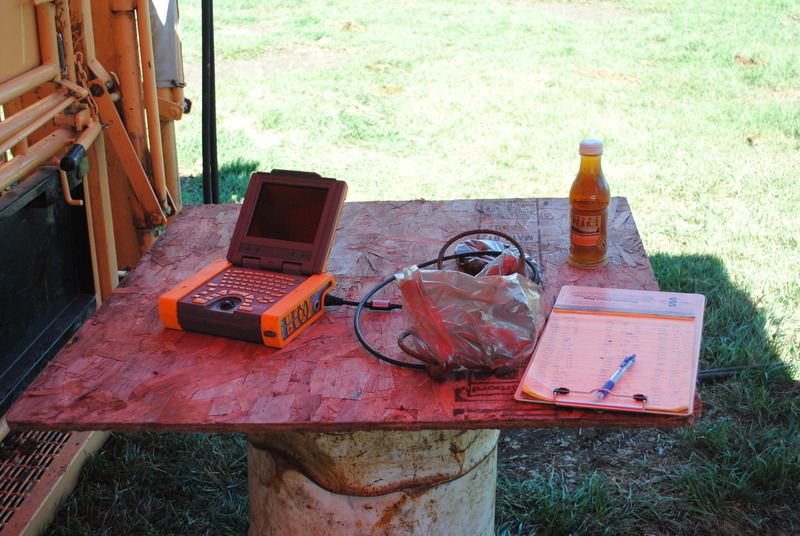 You see, we were ultrasounding our cows, to find out which ones were going to have calves and when they would be having them. Just like at the OB’s office! That’s right, we used an ultrasound machine…much like the one that is used every day by obstetricians when they are looking for a baby’s heartbeat, measuring the size of the baby or checking for any other problems. Why would using a machine like this be important for our cows? One reason is where we live. Since we start calving in February in North Dakota, it’s important to know which cows should be calving and approximately when. That way we can make sure that they are closer to the barn, so they can hopefully have their calves inside, where it’s warm and protected from the elements. The head gate makes sure that the cow stands still and doesn’t hurt itself. 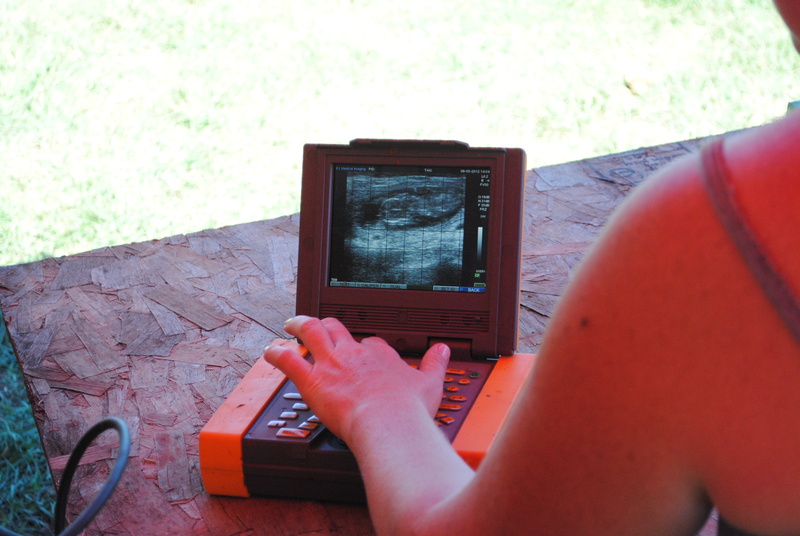 Another reason we use ultrasounding is so that we can more accurately determine those cows that are definitely having a calf, and those cows that are not having a calf (we call them “open”). 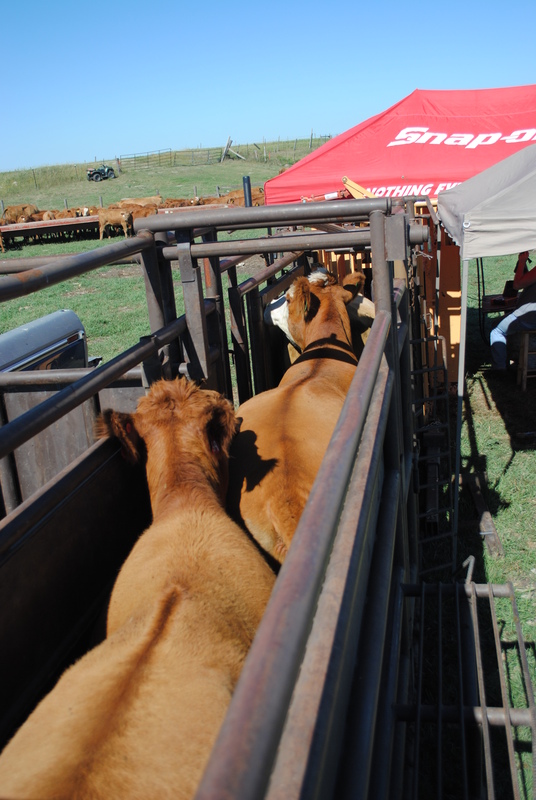 It’s expensive to raise cattle, even more so right now. We only keep the cows that are bred and the ones that are “open” are sold. Many times our open cows go to other farms that have a different calving cycle then we do, allowing them the chance to become bred later. The girls, waiting their turn! Once the probe is in the cow and an image is on the screen, a measurement can be taken, just like how the technicians measure the length of a baby’s bone to estimate it’s gestational age. 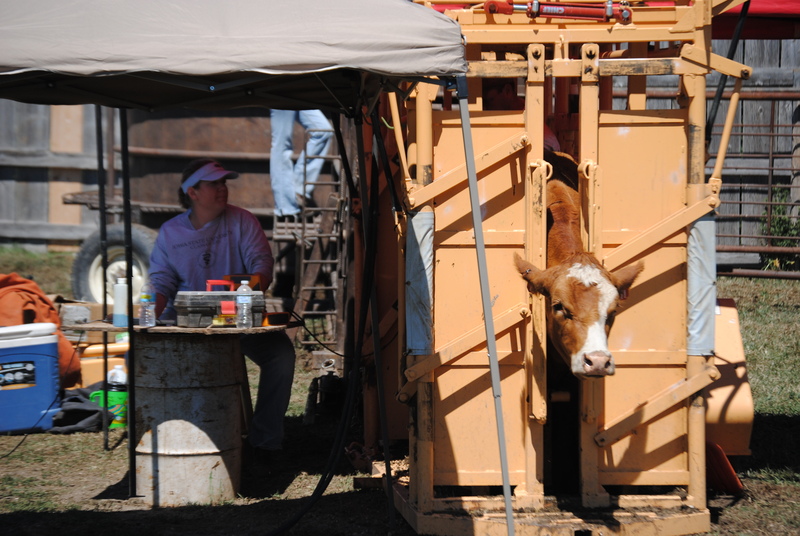 On a calf, the measurement is taken of the space between the eye sockets on the head. The number of centimeters between correlates between the number of days the calf has been in the uterus, giving us an estimated “due” date. The calf’s age can be measured on the screen! Of course, these numbers are just estimates, but every bit of information that we can use to ensure our herd is taken care of and healthy is definitely a step up from before! This entry was posted in Agvocacy, Calving, Cows and tagged agvocacy, calving, cow facts, cows, farm questions, life on the farm by wagfarms. Bookmark the permalink.